Every month we love featuring a new author as part of our Virtual Book Club for Kids. 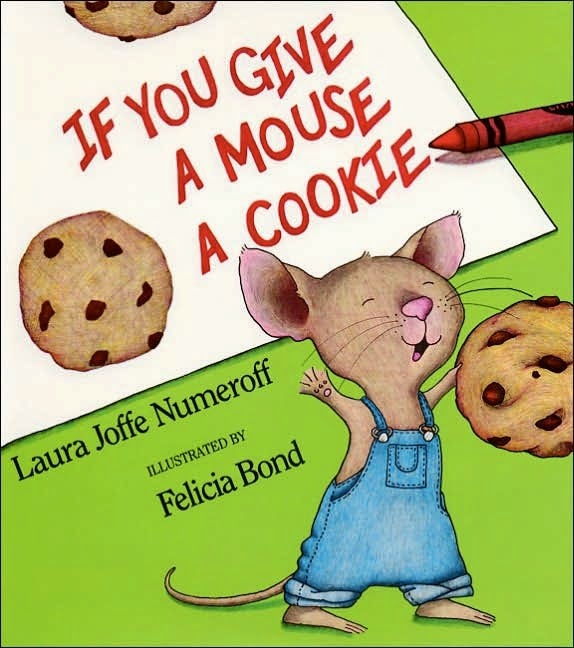 This month we are featuring Laura Numeroff and we decided to do an activity inspired by If You Give A Mouse A Cookie. 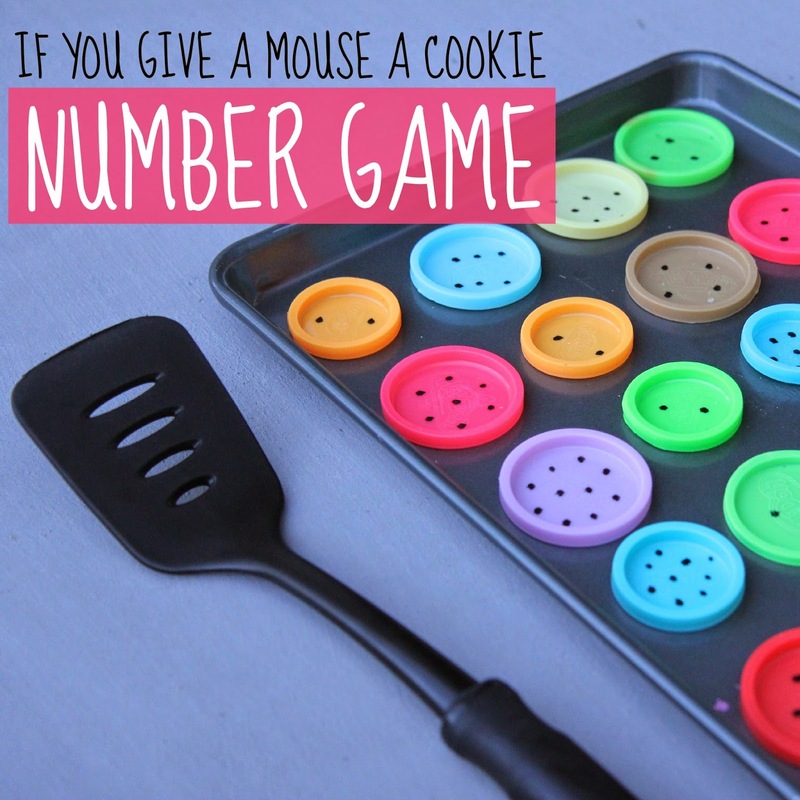 Since we are big fans of chocolate chip cookies and learning numbers, we created a number game to play after reading If You Give A Mouse A Cookie. If you haven't read If You Give A Mouse A Cookie yet, I highly recommend it. My kids love the antics of the silly mouse. The mouse starts out wanting a cookie and then needs a glass of milk to go with it... and the continues to need other things. He makes giant messes and leaves the little boy exhausted. We have several versions of this book (hardcover, paperback, board book) at our house because the kids like it so much. We also adore the illustrations. To prep ahead I made several pairs of lids, each with a specific number of "chocolate chip" dots on them. I used a whiteboard marker because I hate to waste lids so wanted to be able to reuse these again at some point for another game. Eventually the whiteboard marker can just be wiped off the lids. Once all of the "cookies" are "baked" with numbers on them (ie. the number dots are written on them)... you are ready to play! 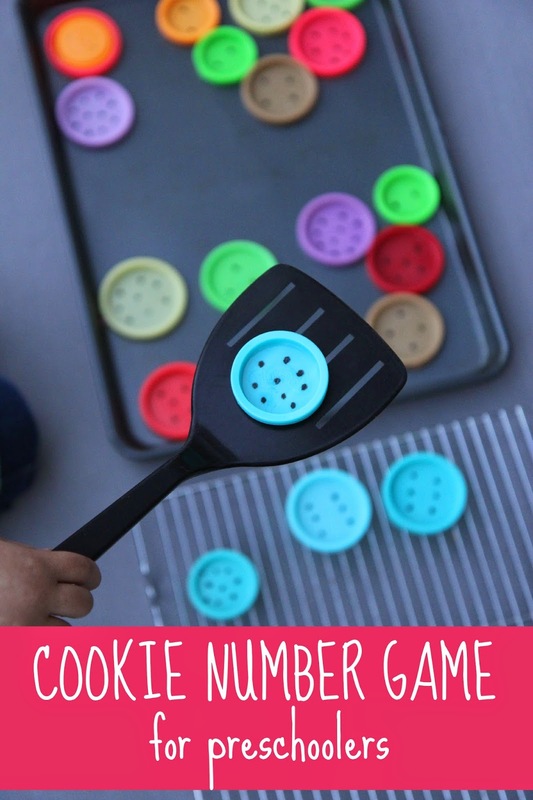 Make sure that each cookie lid has a matching lid with the same number of dots on it before you get started playing. We used numbers 1-10 for this version of the game. Using a spatula (or pancake flipper... or whatever you call it), pick up two matching "cookies" that both have the same number of "chocolate chips" (dots) on them. 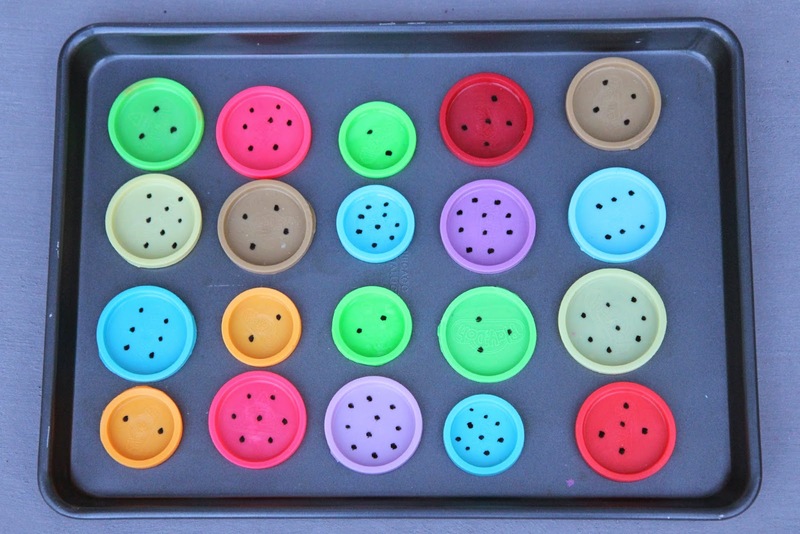 Count the dots just to double check and then place the matching cookies on the cooling rack! The goal of the game is to get all of the matches onto the cooling rack. You can work alone or together or compete against a partner. My 4 year old thought this game was fun and she especially loved using the cookie spatula. It was hard work to pick up the cookies and transport them... so sometimes she used her hands to put them onto the spatula and that is totally fine to do! Not only did this activity work on counting and visual discrimination, it also worked on strengthening fine and gross motor skills. We are also spotlighting two other books by Laura Numeroff this month as part of Virtual Book Club for Kids- If You Give A Pig a Pancake and If You Give a Moose a Muffin. We have both of these others books as well and they are always hits at our house. Below you'll find several other awesome Laura Numberoff inspired activities shared by our Virtual Book Club for Kids co-hosts if you are interested in checking any of them out! Do you have a craft or activity you've done along with one of Laura Numeroff's books? Come share your ideas with us over on our Virtual Book Club for Kids Facebook page! My little ones are going to love everything about this game! And, I love how easy it will be to prep. Thank you! I save all of our lids like a hoarder so I'm happy to have an activity idea now! Thanks! I love that you can reuse the lids for other activities! Such a fun idea! I have a million play dough lids just waiting to be reused. I might write some letters on them for a different matching game.